If you or a loved one has been injured in a bicycle accident, you may have questions about “what to do next,” and you may not even know where to start. We offer a FREE consultation, 24 hours a day, 7 days a week, There is NO cost to get a free consultation right now. If you decide to hire our New York City bike accident lawyers, you pay us nothing up front, and you will pay absolutely nothing at all unless and until we’ve won your case. No matter how careful you are when you ride your bicycle, and even if you wear a helmet and other protective gear, you face severe injuries in a bicycle accident. Our New York City accident lawyers have had the sobering task of representing many of his fellow cyclists in New York City when they were injured in bicycle accidents due to other people’s negligence. In New York City, bicycles are a popular method of transportation both for business and pleasure. Cyclists often ride high-speed bicycles for exercise while bike messengers make important deliveries throughout the city. Recently, New York has announced a bike share program called Citi Bike allowing people to swipe a credit card at hundreds of bicycle stations in Queens and Manhattan, take a bike, and ride it around New York City. It is a simple, environmentally friendly, and inexpensive way to get around. The invention of the bicycle dates back as far as 1493 to a pupil of Leonardo da Vinci. Taking this simple human-powered machine and placing it on the busy streets of NYC will, of course, lead to dangers. Bicycles have to share the roadways with cars, large buses, tractor trailers, and other vehicles. Many native New Yorkers and tourists greatly enjoy riding bicycles around town when we’re not facing bad weather. In fact, Citibank’s bike sharing program can help nearly everyone get around Manhattan, Queens and the Bronx. The annual membership program works for many, while others are fine with just paying for a day pass so they can ride to meet a friend or colleague for lunch – or take in a museum or simple tourist attraction. Whatever you do, be sure to ride friendly since about 200,000 people ride bikes here on good weather days. In fact, about twice a month, close to 500,000 adult New Yorkers ride their bicycles all over this big metropolitan area. While being out in the open air and feeling the city’s excitement can be fun, you still need to observe all of New York City’s Department of Transportation (DOT) rules and regulations while riding. Here’s a quick overview of many of these requirements, followed by a summary of basic bike safety tips to help you reach every destination in great shape. If you were involved in a bicycle accident in NYC, New York, contact the experienced New York City bike accident lawyers at Frekhtman & Associates. We have handled many New York bicycle accident cases and will expertly guide you. Because bike riders are unprotected and their bodies are out in the open, they often suffer more devastating injuries in crashes than those seen after typical motor vehicle accidents. In Neno-faultno fault benefits are available to bicycle riders who are involved in an accident with a motor vehicle. These benefits pay up to $50,000 in lost wages and medical bills. A no fault application must be submitted within 30 days of the accident. A serious medical injury following a bicycle accident requires treatment with the best doctors. Frekhtman & Associates works with many top specialists including neurologists, orthopedists, surgeons, and other medical practitioners. Doctors are a vital part of your injury case since they will provide medical care after your accident and also may come to court to testify at the time of trial. Along the same lines, Frekhtman & Associates spares no expense in prosecuting a New York City bicycle accident case by hiring other experts including accident reconstruction liability experts, vocational rehabilitation experts, economists to prove lost earnings, and other top experts. Feel free to contact us by phone, online form, or email for a free confidential consultation. We will be happy to have a friendly talk like you would with a trusted friend. You’re going to need a New York City bike accident lawyer if you’ve had a bike crash on the street by fault of someone else. And if you live in New York, you have one particular state law on your side that’s going to help you tremendously if you’ve suffered an injury. Overall, though, you probably want to know what the most common bike accident scenarios are and what the legal outcomes may be for each one. No matter how you were hit, the law firm of Frekhtman & Associates analyzes all existing laws and situations thoroughly to assure a strong case. Being Hit by a Car or Other Vehicle – Most commonly, you’ll be hit by someone driving a car, bus or even a taxi while biking through New York City. Fortunately, you can use the New York “No Fault” law where you have up to 30 days to file a claim on a bike injury. But you’ll have to know the name of the person who hit you and what their insurance information is. Their insurance will be the ones who ultimately pay your medical bills as well as paying any litigation if there’s a lawsuit involved. A Bike Accident From Street Issues – While less common, a crash on your bike due to a pothole, manhole cover or construction equipment can create more complex legal cases. Nevertheless, municipal authorities can be held responsible if they don’t maintain proper road maintenance. You simply have to prove that those authorities were aware of the situation and did nothing to repair it. In the case of potholes, it can get a little more complicated. Only if the city had prior knowledge of the pothole and did nothing to fix it will you have a case. This can sometimes be complicated to prove. Regardless, it’s wise to take pictures or video of that pothole so it can be used in your case and reported widely as a deterrent to others. 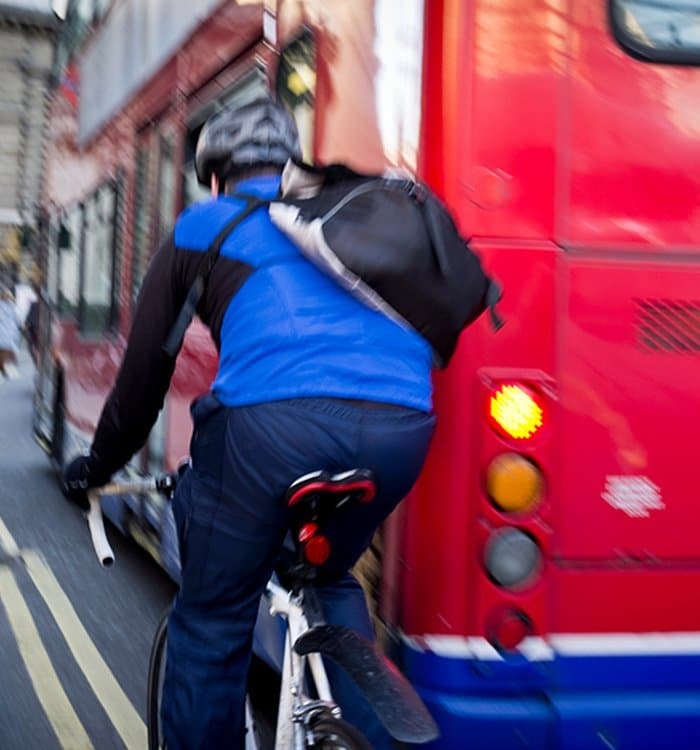 Bike Messenger or Delivery Crashes – In these bike crash scenarios, you’ll be dealing with your employer who might be to blame in not providing you with enough safety equipment. New York law dictates that any business using bike messengers or deliverers have to wear a helmet, install a lamp, a bell, properly working brakes and reflectors. If your employer didn’t provide one or more of these things, you have a good case for a lawsuit against your employer. You should still be able to go off workers compensation to help with medical bills. Keep in mind, though, that you can’t sue your employer if you take workers comp. Hit and Run Cases – These type of bike crashes can be very unfortunate, especially when you’ve suffered serious injury. We’ll do our best to find out who that hit and run driver was so you can file a claim and lawsuit. If that person is never found, we’ll look at your car insurance and see if they provide an option for uninsured or underinsured drivers. Some car insurances do, and they’ll sometimes take a claim to handle your injuries. Cyclists are fighting back. Some have begun to wear video cameras on their helmets to capture the car description and plate number of a vehicle that leaves the scene of an accident. If a car hits your bicycle or forces you off the road and causing you to be injured, if you or a witness can identify the driver, you can file a claim against the driver to recover your damages. If the driver gets away and is never located, your own uninsured motorist policy may pay for your damages instead. Nobody wants to get into a bicycle crash, but sometimes it just can’t be helped. Crashes are even more common when commuting in an urban environment where congested streets are regular. If you find yourself in an accident, it’s important to work with bike crash lawyers that know all about no-fault laws. No-fault doesn’t mean that nobody is at fault in the accident, it simply means that when an accident occurs between two motor vehicles the auto insurance company for the vehicle an injured person is physically in will pay first party medical benefits to hospitals, doctors, and other medical providers up to $50,000. This type of auto health insurance comes with auto insurance as standard. If a bicyclist is hit by a motor vehicle, the auto insurance of the vehicle will provide this Personal Injury Protection or No Fault first party benefits. From the time that you get into an accident, you have up to 30 days to file a no-fault claim and to have your expenses paid for. This could help you cover your medical expenses, the costs to have your bike repaired and your lost wages from being stuck out of work while recovering from the accident. If you fail to file the proper paperwork though, you won’t get any of this compensation, and that’s why a good quality lawyer is so important. Talk with New York City bike crash lawyers that know all about this law, and make sure that the necessary paperwork is in place as soon as you can after a crash. Your best bet is to get in touch with a quality legal team to establish a relationship now, before you ever get into an accident at all. Then when you do run into an issue, you can simply call your legal team and everything will be taken care of for you. If you want to cover your bases now contact us and we’ll explain to you how no-fault works and how you can safeguard yourself against a possible crash in the future. 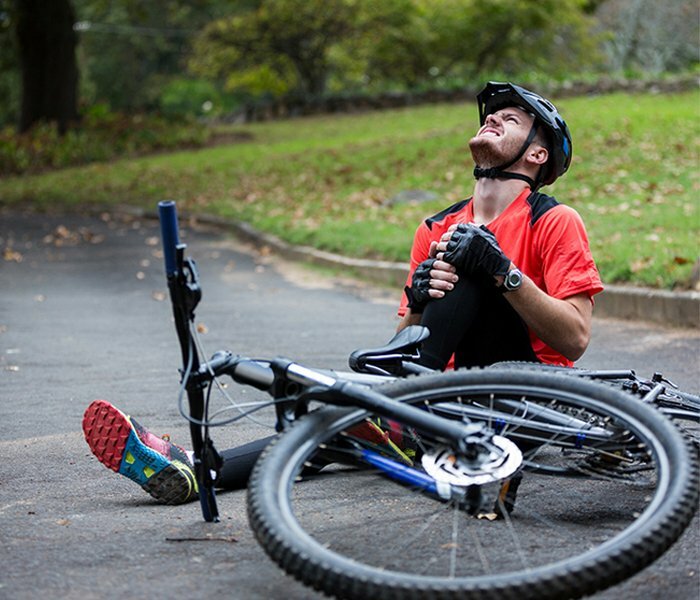 What Should You Do if You Were Hurt in a Bicycle Accident? Collect information – If you are not too injured to do so, gather information about the way your accident occurred and the people involved. Get the name of the driver as well as the car’s license plate number. If possible, take pictures of the aftermath of your accident and get contact information from any witnesses. See a doctor – Always see a doctor after an accident. This is true even if you believe that your injuries will resolve without medical treatment. Doing so will generate evidence you can use to establish your damages with the insurance company or the court. Sometimes bicycle fall injuries only manifest themselves at a later date and it important to see a doctor to get checked out. Retain an attorney – The best way to protect your legal rights is to secure the representation of an attorney as soon as possible after an accident. A lawyer will handle all communications with the insurance company on your behalf and ensure that you do not say or do anything that will hurt your claim. In addition, your lawyer will attempt to negotiate a settlement agreement that adequately compensates you for all of your potential losses. Finally, if the insurance company does not make you a reasonable settlement offer, your attorney may file a personal injury lawsuit. The bicycle accident lawyers at Frekhtman & Associates understand how to most effectively represent bike accident victims so they can recover the full amount of compensation possible. Remember—you pay us nothing up front when we take your case, and you pay us nothing unless and until we’ve won your recovery. Here at Frekhtman & Associates, we’ll work with you every step of the way through the above scenarios to ensure you get the compensation you deserve. Contact us if you’ve recently gone through a bike accident so we can get your case started. We understand that after a bicycle accident that your injuries might restrict your mobility. Our New York City bike accident lawyers have multiple attorney office locations throughout the five boroughs in New York to help serve and make it easier for you to be able to see an attorney near you.